Today marks the United Nations’ World Water Day and offers a great reminder for Californians to think globally but act locally when it comes to conserving and protecting the state’s water supplies, Apply Responsibly officials said. World Water Day is held annually on March 22 as a means of focusing attention on the importance of freshwater and advocating for the sustainable management of freshwater resources, according to the UN division of Educational, Scientific and Cultural Organization. 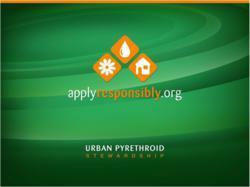 For the past five years, Apply Responsibly has promoted the need to safeguard California’s waterways. “While water issues may be as diverse as the world’s cultures, one common theme Californians share with the world community is the need to conserve and protect water supplies,” said Ann Orth, chair of the Urban Pyrethroid Stewardship, an industry alliance that created the Apply Responsibly program. The stewardship group, comprised of the nation’s leading pesticide industry companies, was established in 2008 as a way to inform California consumers about the important link between responsible pesticide use and safeguarding the state’s water and the environment. Since then, Apply Responsibly has sponsored annual public awareness campaigns that have included mass transit, radio and online advertising, earned media, informational videos and participation in statewide environmental stewardship events. Take measures to conserve water in their home gardens and yards. “By taking simple actions like these, Californians can do their part to honor the spirit of World Water Day in their own backyards,” said Orth.